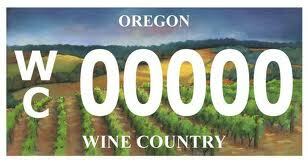 Oregon offers special winery license plates. Napa needs one. Oregon drivers who are tired of the image of a tree, Crater Lake or a salmon on their license plate will get two new choices next year. One will celebrate Oregon as “Wine Country” and may feature an image of rolling hills of vineyards. The other will be an image — the specifics are as yet undetermined — that relates to keeping children safe. The two new specialty plates were added this year by the Legislature to the growing roster of plates the state offers for a premium. Officials last week released a mock-up design for the new wine industry plate. The plate will cost a premium of $30, and proceeds will go to the Oregon Tourism Commission to support marketing of Oregon as a tourism destination, officials said.